Ooh! Look at that cutie pie bullet with the giant fez*! Aww... SPLOT! Anyway, don’t let visions of such folk discourage you, for what we have here is a slick hybrid of pure arcade twin stick shooter and somewhat more grey-matter demanding dungeon crawler that’s infinitely more worthy of your time. Back to those bullets. 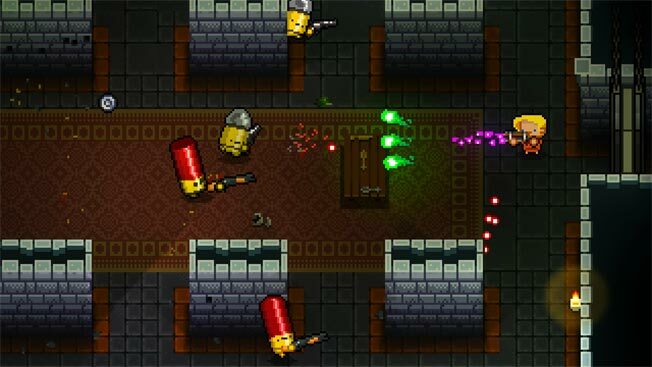 As you plough through room after room searching for each level’s big bastardly bad, you’re assailed by all manner of shooty-shooty villainy – the ‘gundead’. Many are varying smiley-faced assassin bullets that beget littler bullets. Don’t stop to think about that – anyway, if you do you’ll likely be endeadened. Luckily you’re scarcely armed with a peashooter. While weapons do start out fairly mundanely, your arsenal (hi Moz!) can eventually boast weird and wondrous weaponry that spews forth everything from rainbows to bees – just like Homer imagined Mr Burns’ hounds, but, erm, without the actual hounds. You’ll also meet the odd (literally) ally on your travels. Plus you have other helpers like the ability to do a quick duck and roll when things get hairy, or flip tables for cover (or just for fun). It’s all randomly generated, so each time you enter the breach with one of four protagonists, all of whom are seeking absolution by reaching a megagun that can kill the past, things will look relatively shiny and new. Or at the very least doors will be in different spots. Rampant weapon worship has never looked this cuddly. Or sounded so good, or played so challengingly well... Happiness is a warm Gungeon. * Yeah, we know they’re actually cutesy shotgun shells.